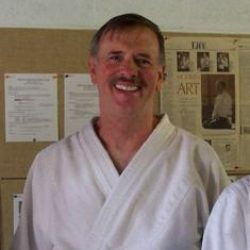 Dwight Petersen Sensei is the founder of the Fredericksburg Aikido Club. 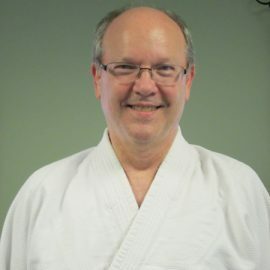 Petersen Sensei discovered the physical and mental benefits of the martial arts when he took a college judo class. “Some years later, I realized I was probably never going to get any exercise the rest of my life,” said Petersen, who then worked in San Francisco as a computer programmer for the Army. He flipped through the Yellow Pages in search of a Judo dojo and stumbled across an Aikido class, instead. He found something in its falls and rolls. Something spiritual. Something he couldn’t give up. He started his training at the legendary Turk Street Dojo in San Francisco. 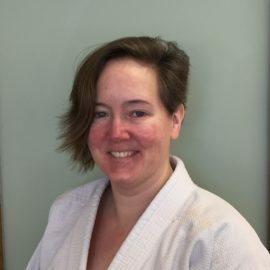 As a military employee, he traveled extensively and has trained at dojos around the world. He is a retired Army Reserve Officer and currently works as a computer network administrator. 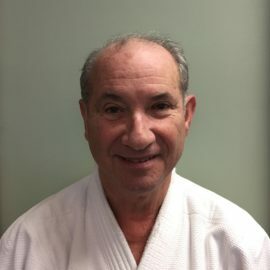 He received his shodan from Saotome Sensei at the Shobukan Dojo in Takoma Park, Maryland. 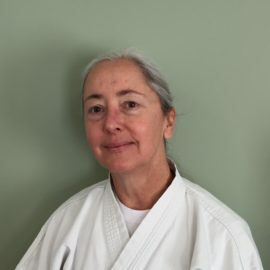 He has been training in Fredericksburg since 1993, successfully tested for sandan in December 2006, and was awarded Fukushidoin (certified assistant instructor) in June 2014. He is considering retiring to North Carolina.